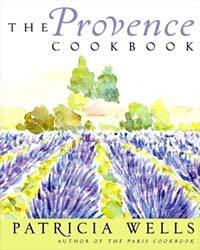 Patricia Wells once again invites us to visit her adopted home of Provence, France. In The Provence Cookbook, Patricia shares some of her favorite regional recipes and ingredients for simple French fare, takes us to some of her secret food haunts, and introduces us to a few of her friendly local food purveyors and vendors. The 175 recipes in this personal collection are a reflection of Patricia Wells’ love for the countryside and her strong connection to the local farmers and food purveyors who supply her with the freshest and the best possible ingredients. There are twelve tempting menus—delight in An August Dinner at Sunset, or perhaps A Winter Truffle Feast—that inspire you to bring together a truly French meal. The bright, clean design and photographs evoke the sunny, crisp Provence countryside. Both a wonderful recipe collection and French culinary reference, The Provence Cookbook with its restaurant and food shop recommendations and contact information is also an invaluable guide for anyone planning a visit to this bountiful region. Another winner from a much loved authority on French cuisine and culture.